Our Heavy Industry branch has been increasing in capacity over the past three months and we’ve reached a point where we now have an established, balanced cycle. This balance comes from many factors including the amount of compression or ship BPOs we own, ISK velocity coming in from purchases or sales, and time needed to haul or compress materials. Too much or too little of either factor and our porridge is no longer ‘just right’. The optimal cycle we have found settles is around 18 days. 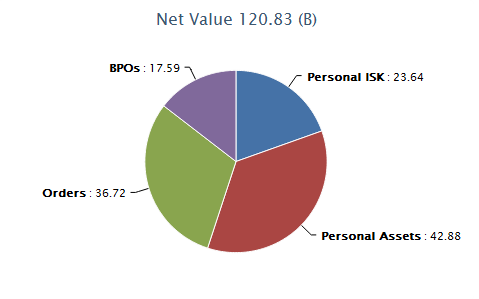 With every cycle we are consuming around 12-13 B ISK worth of materials in order to keep our BPOs busy. 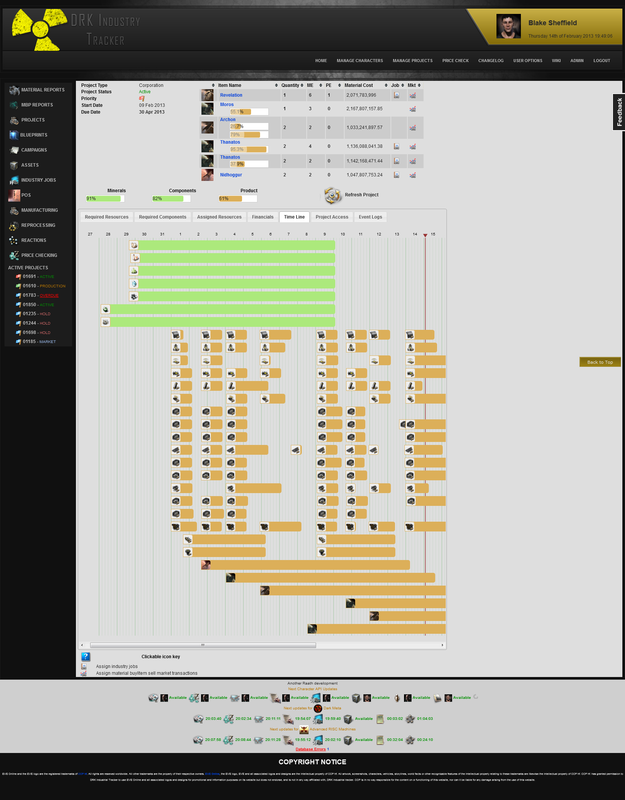 With the aid of the DRK Industrial Tracker, we can easily see how long it takes to compress, build component parts, and finally build the capital hulls in a easy to read visual timeline. If you produce items and need a solution for tracking materials, quotes, projects, and sales I highly recommend this product. As the amount of time put into daily trading slowed down towards the 2012 holiday season, I put the direction of the Heavy Industry branch in the hands of Raath (@staticmapper), my partner. The operation started to get its legs in December and the results are apparent. Jump capable ships have a fairly easy production workflow; common minerals are made into capital components that then get combined into the ship hull. There is no invention process, no reliance on moon reactants, or even a multistage reaction process like Tech3 hull/subsystem production. The con to the production process is that there is a high barrier of entry and a ISK sink into blueprints. 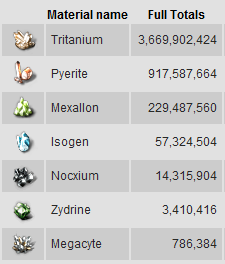 I estimate that I moved around 30 B into BPOs and starter minerals to begin producing the 4 racial carriers. My first stage is to start up Carrier production, which is coming along nicely. Carrier blueprints have been purchased, researched Tech 1 module blueprints that are mineral compression friendly were bought on contracts, a highsec compression office was rented, and a cyno chain to the production system was mapped out. The second stage of the plan is to eventually expand into Dreadnought production, which require a few more Capital Component BPOs. 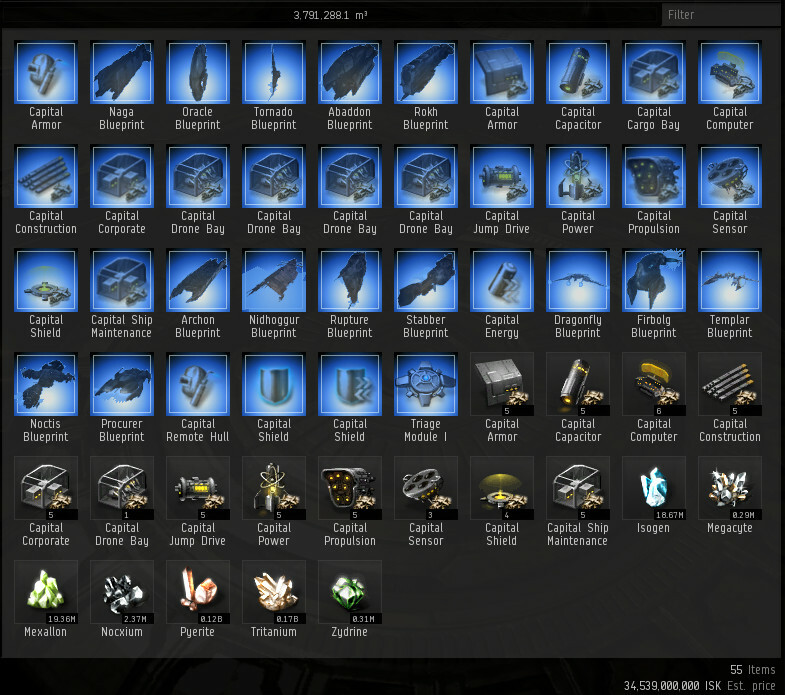 Once I start to sell Carrier hulls and Capital modules, I’ll move more ISK into blueprints for these heavy hitters. The initial purchase was for a researched set (ME 100/PE 20) of every Carrier Capital Component, 4 Racial Carriers, Fighters, and Capital Module BPOs. Using the magic of mineral compression, I transported 206,500 m3 of modules and produced 1,608,535 m3 of minerals after the refine process. The modules’ volume was only 12.8% of the expanded mineral size. Here’s a screenshot of my Industry Dashboard that I built in my Wallet Manager program to help keep track of all the different jobs bring run by different characters in various locations. This pane helps keeps a nice overview of the manufacturing and research process, which I can bring up on a computer, mobile, or even a tablet device. Since I missed my April update, this report will contain some events from April. Drone mineral drops were removed, market and macro bots were banned, RMT was again cracked down on, Vanguard sites were nerfed, Technetium prices were controlled, faction/deadspace/officer items were added to the market, Nocxium’s artifical price ceiling was removed, and datacores were moved to Faction Warfare. Whew. All these changes combined with the Burn Jita and Hulkageddon V event meant that prices were volatile. I have joined TEST and have been working with their market division, which seems to be a perfect fit for me. TEST has a very savvy development group that has no trouble coding up sites to manage our efforts. Order highlighting has improved the speed and accuracy at which I can update orders. I spend about 20 minutes a day total broken into two sessions updating prices. 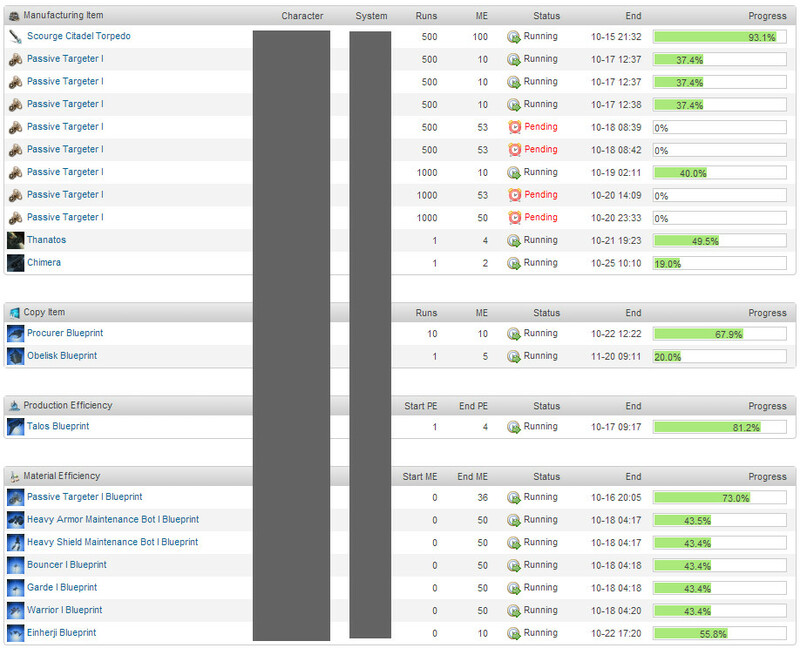 I tend to update after downtime and around 23:00, which is US prime. 172,592,790,045 sold so far in 2012. 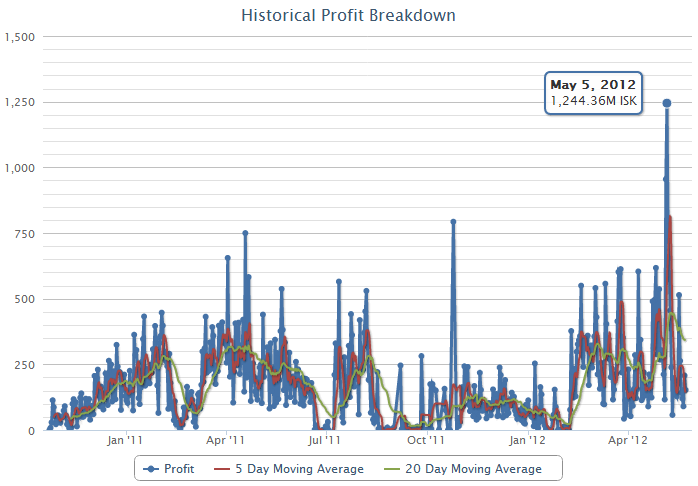 35,912,308,945 profit so far in 2012. 12,340 transactions so far in 2012. 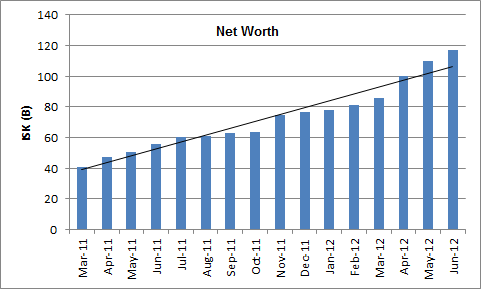 2,921,500.42 average profit per transaction in 2012. 10,843,867.01 standard deviation per transaction in 2012. 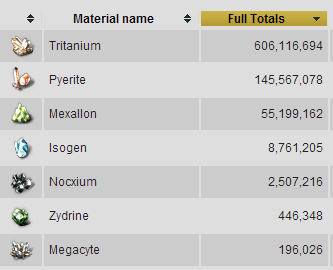 Top item by quantity was Tritanium with 90,272,146 sold for a profit of 306,018,174. Worst profitable item was 1600mm Reinforced Rolled Tungsten Plates I where I lost 49,869,884. Best trading day on May 5th with a total profit of 1.24 B beating out Oct 24, 2011 at 793 M when I sold a Jump Freighter I build from scratch. Keep doing what I am doing and keep putting liquid ISK back into the market. I spent some money and picked up 305 Tech 3 Subsystem BPCs. The return isn’t that high, so I might put this project off for a later date or work with a production partner to complete the batch. The addition of officer/deadspace/faction items has opened up new area of trading. I have been having good success with these and am slowing building my list of items to watch. 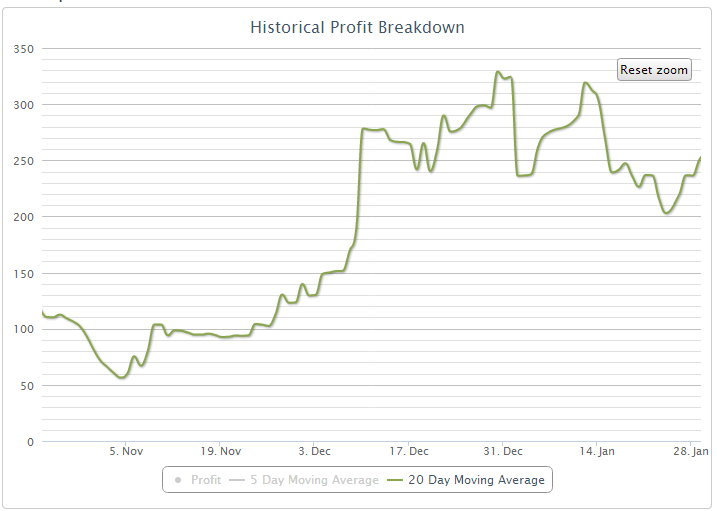 New modules are almost always insanely profitable. 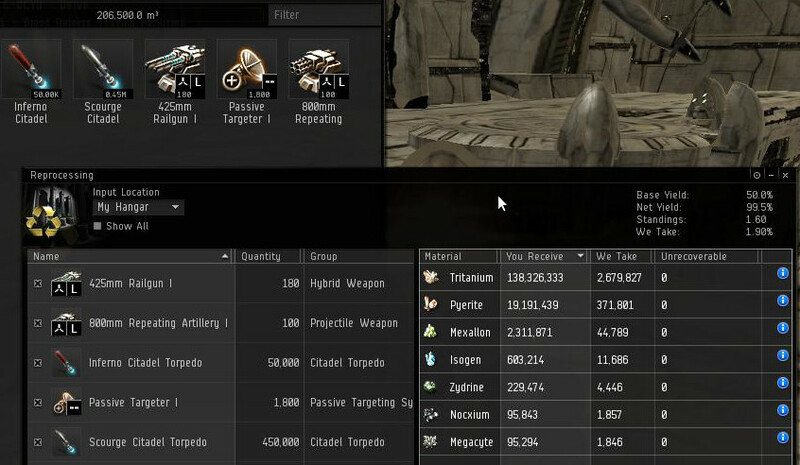 The addition of the new Inferno modules have so far proven to be very lucrative.